The U.S. Navy McDonnell Douglas F-4J Phantom II (BuNo 155800, NG-100) VF-96 Showtime. 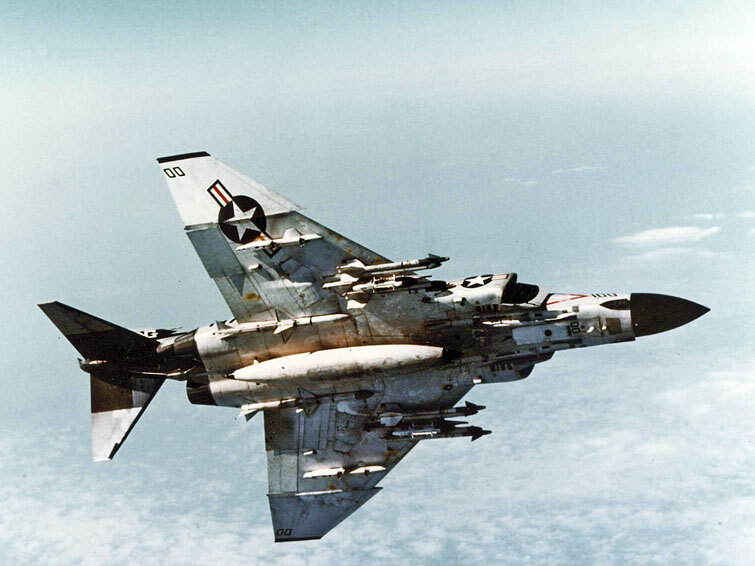 This aircraft was assigned to fighter squadron VF-96 Fighting Falcons, Carrier Air Wing 9 (CVW-9), aboard the aircraft carrier USS Constellation (CVA-64) in 9 February 1972. Having the callsign "Showtime 100" it was used by Lt. Randy Cunningham and Lt.JG Willie Driscoll for their 3rd, 4th, and 5th MiG-kills on 10 May 1972. However, it was hit by a North Vietnamese SA-2 surface-to-air-missile and the crew had to eject over the Gulf of Tonkin.